I am one of those people...you know, the kind that if I'm not good at something the first time I do it I won't ever do it again. I know. It's not a good attitude to have and but at least I'm aware of it and acknowledgment is the first step, right? When I was about 14 I made my first loaf of bread by hand, no machine. My mom was disgusted. She said my first loaf ever was better than hers had been as a married woman. I thought no biggie, you just follow the directions...then I tried to tackle biscuits. My dad makes amazing biscuits: big, fluffy and golden. Buttermilk, sourdough, plain. You name it he can make it. Yeah...so apparently I didn't inherit the biscuit gene. I have tried for years (one of the few things I've tried more than once after failing miserably)! My dad even gave me his marble rolling pin and easiest, no fail recipe. They still came out barely taller than they'd gone in. 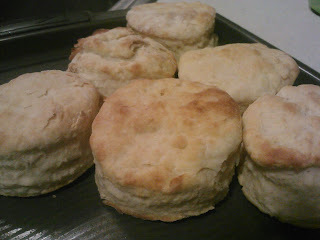 I finally had to just accept I'm not good at it and use Bisquick ..or canned. The shame! The other night the Monster (my 10yo son) wanted to help make dinner. I charged him with making the biscuits. From scratch. I figured they couldn't possibly be any worse than mine and he's more likely to eat dinner if he helps make it (he's my picky one). I was blown away. They certainly weren't the prettiest but they sure tasted good. Tonight he made them again and I give you photo evidence that the biscuit gene must be inside me somewhere dormant because heaven knows I passed that sucker on!! This was only his second time ever baking! Do you know what's it's like to be out baked by a 10 year old boy?! Guess we know who'll be making all the biscuits at our house! Yum! That is very impressive!